Wishing each of you a Happy Halloween full of treats! 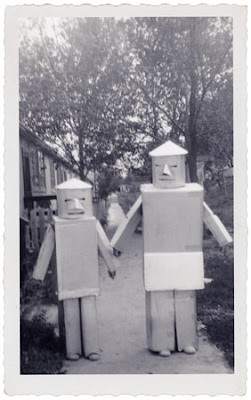 Love these "bots" made of boxes. 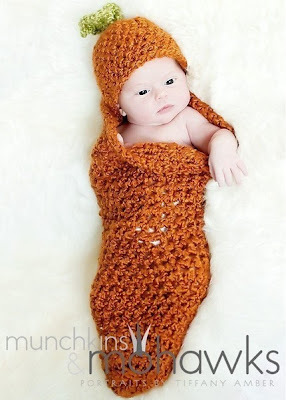 Ah, would you love to crawl into that precious little crocheted sac with that wee punkin. Found over at Etsy - "Kathy Nielsen Designs" - Perfect for a wee one's photo op! Happy Friday to each of you! There is something dear about the "wonderstruck" years. Happiness of a store bought costume and the anticipation of holidays that mark time as well as occasion. Last year my daughter and some friends made it very easy by joining forces and collaborating on being "Super Heroes." It was nice knowing that each one of them had unique powers, all special, none better than the other. 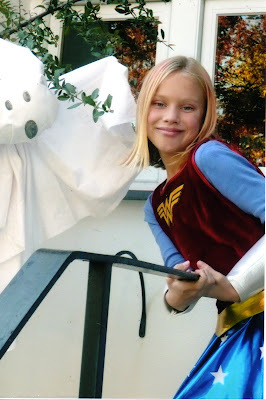 Over the years, I have had great fun making and creating the annual costumes, and often wondered if the level of perfection would bring about wonder or if a "store-bought" costume would be just "fine." Funny how the things we never forget stay with us. We always had to rally and make our costumes, we were "hobos, farmers, indians, cowboys, pilgrims" - all easy to make from things we had. After all, I can not imagine my Mother giving in to "splurge" on seven costumes. How about you, do you remember those wonderstruck years and the trauma that went into the anguish of the Halloween Costume and then to have your big brother tell you, "Who cares about the costume, it is all about the candy and who can get the most!" It made me wonder, is is about the candy or the costume? What say you? 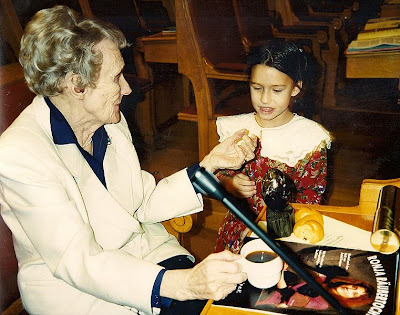 Did you know that Swedish born, Astrid Lindgren wrote Pippi Longstalking while her daughter Karin while was ill and bed-ridden. Her daughter asked her to tell her a story ( I love knowing personal bits!) If I were sick in bed and I was being told such a story, I can imagine feeling so much better, just imagining this character of amazing strength and stamina, being able to lift a horse, now that is impressive! One of my favorite scenes is when she makes the pancakes, and how could you not love her side-kick monkey? Astrid apparently never made much money, however she saved and she traveled and she was very active in many worthy causes. 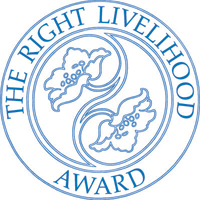 Astrid won the "Right Livelihood Award " for her efforts in children's rights. 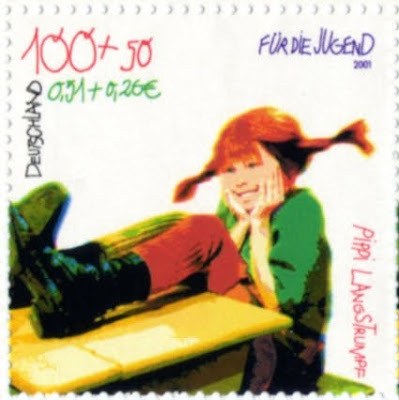 The story "Pippi" was rejected, (prior to the story being published) and now has been published in more than 94 languages. It has always been one of my favorite stories as I feel that Pippi had fun, she enjoyed herself no matter what anyone else thought and she had such style. Even her name just makes me smile and want to wear mis-matched socks and pig-tails. Come back for another fun post on Pippi this week! 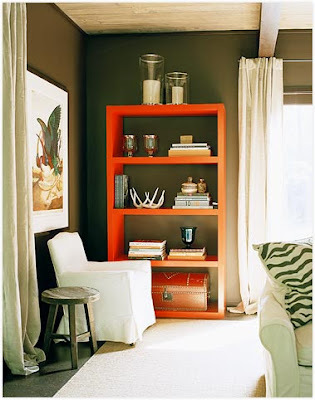 Loving this "pumpkin orange" book shelf and the way it adds a pop to this neutral room. Now I want a painted bookshelf to call my own. Maybe all the orange pumpkins are sending me subliminal messages. I just looked down and spotted that I have "300" followers. Thank-you to each of you for visiting. Hope you will visit often and be inspired to live an artful life, even on the gloomiest of days! Autumn is such a spectacular season, full of color, falling leaves, cooler temps and all the bounty of fresh apples, pumpkins, root vegetables and the clarity of the light, and then October goes and Novembers enters. 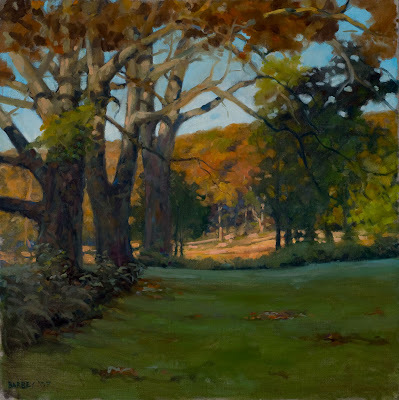 Always in season, are wonderful landscapes painted by my dear friend Geoffrey and beloved painting prof. asked if I would mind to post his work for him as he has a few paintings. Can you tell that he really is passionate about landscape painting. 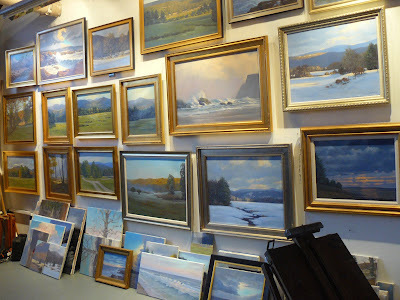 When I began attending classes, there were a few and now there are many paintings. I think some of them need good homes. It never hurts to ask, so if you or anyone you know might be in the market for some original oils, landscapes that show the force of life, the sheer beauty of nature....let me know. I thought I might just ask. What a wonderful gift these would make. The above canvas is a "large" new work, not yet finished, but to see the process, and to appreciate the gift he has for all seasons. Take a look at Geoffrey Barbey's site here. You will be delighted with his work. I love to illustrate things and places with a perspective that will draw one in. 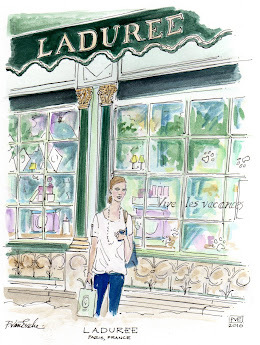 This shop sketch makes me wish I was there now, on the avenue, walking and window shopping. What things lure you and draw you in? I will be singing this melody all day long. Happy Monday to each of you. "Collars up" ~ This fine gal is sporting a fun casual fall look - a shirt with the collars "popped' - a boyfriend vest in merino wool and a generous "Aken" tote constructed of wool felt billiard cloth. Grosgrain ribbon touches give a fun preppy accent to a gingham shirt. 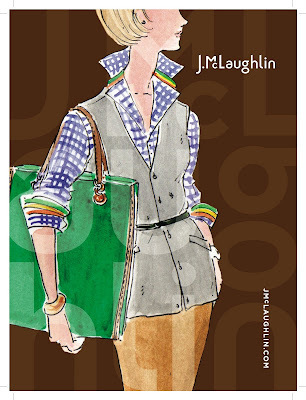 My illustration was in Quest Magazine for J.McLaughlin. Do you wear your collars popped or not? From time to time an e-mail comes my way requesting a barter of sorts. My father was born and his Mother bartered and paid the kind Doctor with a fresh chicken. My Dad loves to tell this story and chuckle about that poor chicken making it to "home plate." So a little barter was agreed upon, a sketch for a platter. 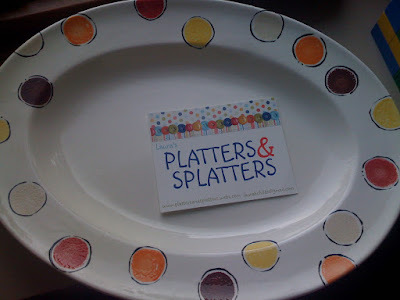 This week, my polka-dot bordered platter arrived. With many holiday celebrations looming, I thought this would be the perfect time to barter a platter for a small home illustration - especially knowing that this sweet gal is holding down her fort at home while her husband is serving in Iraq. 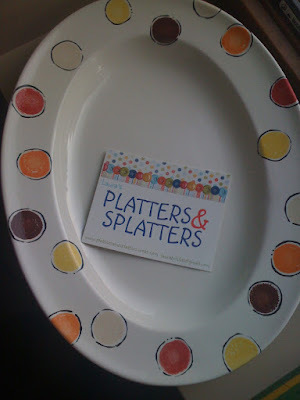 Please take a moment to visit Laura at Platters and Splatters. Tell her "pve" sent you! WINNER OF THE Amy Butler sewing pattern is Mindy! Congrats Mindy, a package is being sent your way today! 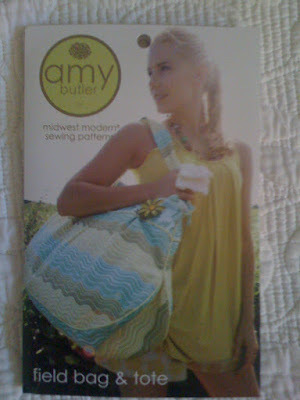 I am honored to be giving away this wonderful Amy Butler Pattern for you to make a field bag and tote! 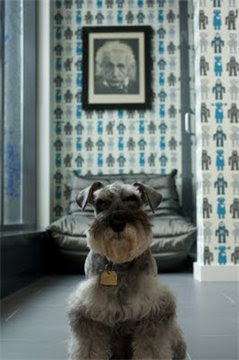 Please take a minute to peruse the site here to select an Amy Butler Design fabric. The colors are pure happiness. The fabrics are cheery and great to sew with. Feel inspired to sew and make this roomy weekend get-away bag? Leave me a comment if you so (sew) incline. Winner will be announced on Monday! Happy weekend to each of you. Please welcome my dear friend Elizabeth to the blog world. You will find her here. I am delighted she has joined us on our journey. 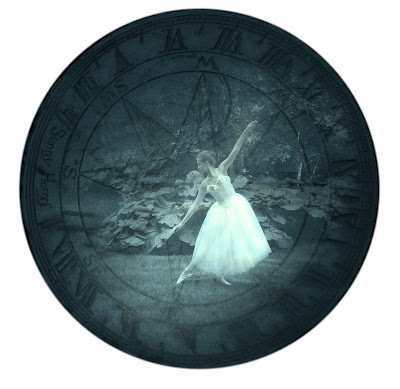 Take a minute to dance over, leave a comment and see her site with her wonderful fine art photography. 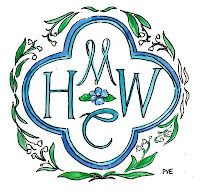 I love staying connected to other artists and hearing about various art openings. 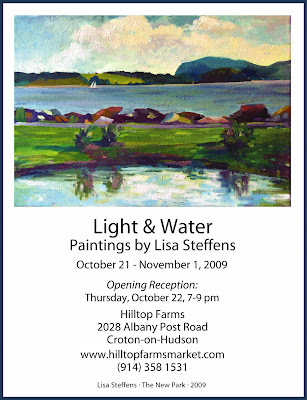 Lisa Steffens contacted me to let me know of an upcoming show. 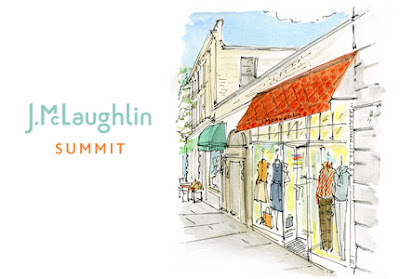 If you are in the area, please drop in and see her wonderful work. I met Lisa several years ago and took a class that she gave locally. She is full of color and loves life. 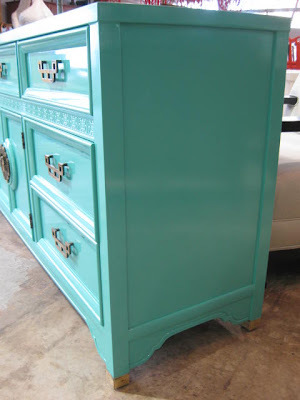 For the love of this cheery dresser, I am on the hunt for some dingy old chest of drawers that need some love in the form of a bright new coat of shiny paint. Amazing what love and the color of the ubiquitous Tiffany Blue box can inspire. I love this gem of a color, how about you? 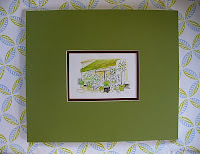 See what a "My little green notebook" did with paint! Look at what Jenny did. Rumor has it that the canvas drop cloth never gets moved for it is in perpetual use. I for one can hardly wait to see what she does next. 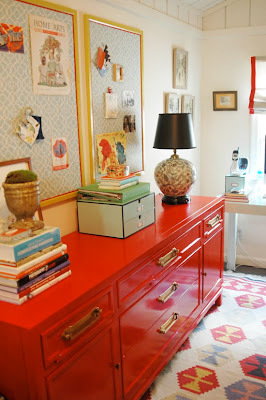 She even painted those boxes on top of that hot-rod red chest. Never underestimate the power of a pregnant lady, especially when something is calling out those magical words "paint me!" Today is all about "warm-ups" - First thing is one-hour of tennis indoors and then back home to grab my knitting bag and gather with my group for our weekly knitting. ( Followed by a pile of artwork to be done! ) which brings me to a list of great ideas for you to "warm-up" to. 1. Clean your house - which gets your blood going. 2. Take a brisk walk which will warm you up and get you going. 4. Make a home-made pot of soup or stew. Your home will smell good too! 5. Take a hot bath. 7. Knit a colorful afghan or blanket. 8. 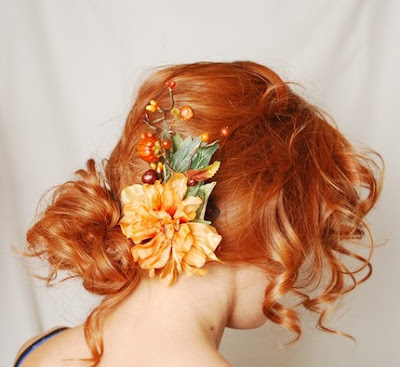 Add warm colors to your home, rusts, orange, red, caramel, browns. 10. Rake leaves or sweep. 11. Make a pot hot mulled cider. 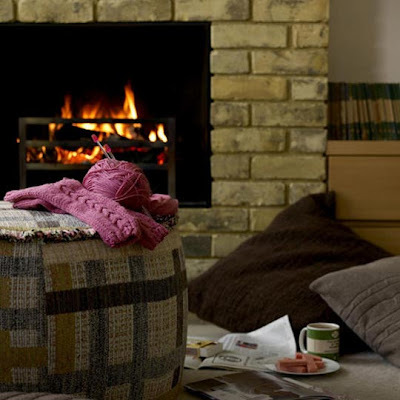 Warm-up your day with just one of these ideas to keep you cozy. How do you warm-up when you have a chill? I have always loved learning about locations whilst I draw various shops across the land of the free and the home of the brave. I am especially intrigued by those that have names of women. Beverly, Mass. 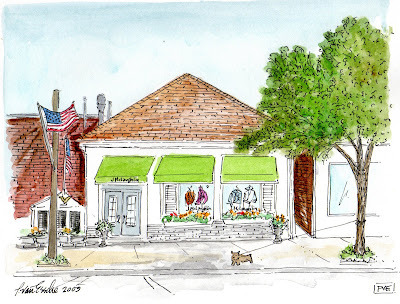 - home to a new shop with fun green awnings and the American Flag flying high. Note the doors and window boxes are black as the top photo. Beverly is after all near Salem and witches need a bit of black to haunt or at least to fly by! Any favorite towns named after women that you like to haunt? 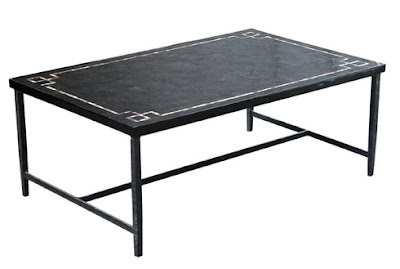 I am trying to "console" myself by finding a console table like this and painting it to mimic this sort of chic finish with the fabulous decorative border (which is actually inlay shell) I would faux-paint it to look like this. 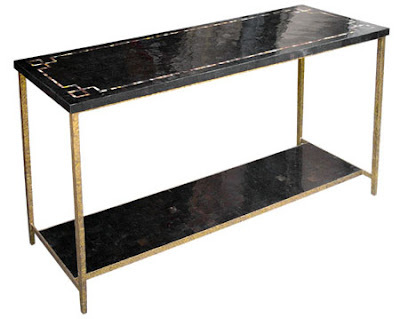 Love the finish, and the skinny gold legs, how it just adds a sophisticated sort of dressed up attitude. I could see painting a tray or a chest or even a small box. Do you enjoy finding things on your list and giving them new life? To me it is like winning a "consolation prize!" 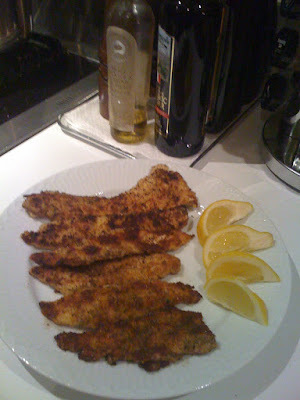 From the kitchen of pve design -"Bobby's Crispy Chicken Cutlets"
Cut the chicken into strips about 1 inch by 2 inches. Season the flour with sat and pepper to taste and spread over a dinner plate, beat the egg in a shallow bowl. Place the bread crumbs on another plate and mix with dill. Dust the chicken strips with flour, dip in the egg, then coat with bread crumbs. Arrange them on a platter, cover with plastic wrap and refrigerate up to 2 hours. Heat the oil and butter in a large skillet over medium - high heat until the butter is melted. Fry the Chicken strips, turning each once, until lightly brown. Plate and serve, either warm or at room temperature, with lemon wedges. "My children love Chicken Cutlets and these were so good, the first plate that I served, I went to fetch my camera to take a photo and came back and they were gone! They loved them, especially the addition of the lemon squeezed on top!" Enjoy these with a salad or some fresh veggies. 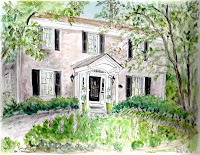 Hop on over to see the virtual "Park Avenue Pot Luck Celebration" here. Hope you are inspired to host your very own Pot luck, be it on the avenue or street where you live! Thanks Kelsey for this easy and tasty recipe and for including me is this Virtual Feast! 1. One of Seven Children, the 5th. 2. Love the color "green" and I was Born on the 17th of March, St.Patrick's Day so I have had many green cakes. 3. I have never met a medium of Art or Arts and Crafts that I did not like. 5. I sold my pictures door to door when I was little for a penny or two. 7. 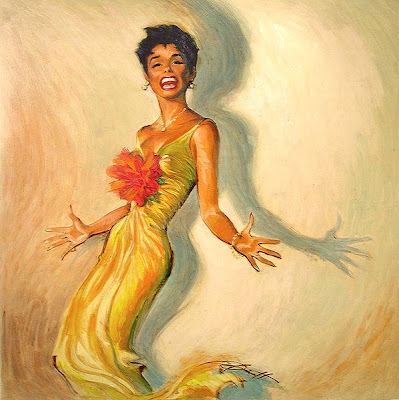 My Mom used to come to New York, and we saw Lena Horne perform. "The Lady and her Music." For some reason, I cannot write below this fabulous artwork of Lena, but thanks to each of you for reading my blog and for awarding this award to me! Thanks! 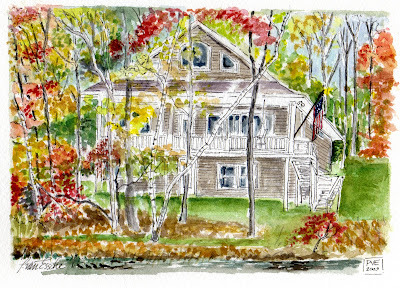 pve design, illustration of "Breezy Hill Inn" located in the Catskills, in New York. 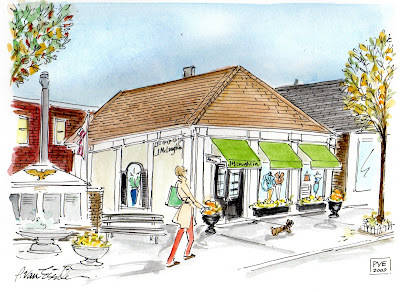 Fall is a time to enjoy the countryside, apple picking, leaf peeping and finding some antiques along the way. 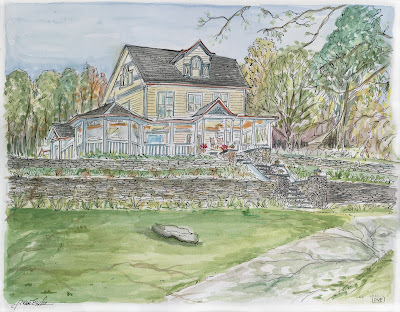 Breezy Hill Inn is perched up high with exquisite views, located in the Catskills. A nice spot to escape to for an Autumnal journey. Meet Einstein. So, tell me do you think having a name after someone can breed intelligence? I met a very small dog named Napoleon with an alpha dog attitude. Hope you have a swell Saturday Mr. Smartypants and Mr. Big-stuff. Good luck gentlemen! May the force be with you. How many of you are "working to make a living or living to work?" I seem to hear that I am not alone in this quest, especially in these challenging times. Daily, it seems that I have an e-mail requesting a "give-away" or for barter or for "free." I just want to hear from you, from my readers. 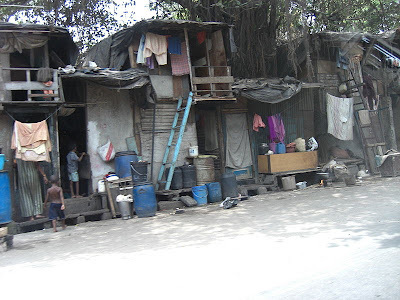 What conditions does your livelihood need in order to survive? 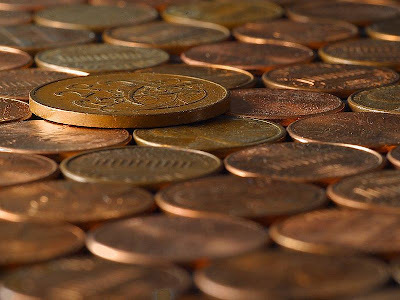 Do you work for free just because you love it or you want to give it away for a worthy cause? Do you set limits, or are you a scrooge and never give anything away in order to protect your livelihood. Are you perhaps working towards a Nobel Prize? Let me hear from you? How are you handling these tricky times with your work, have you been expected to take a pay-cut, to work more hours, to work for free or to pay yourself $1 dollar like some very successful people? 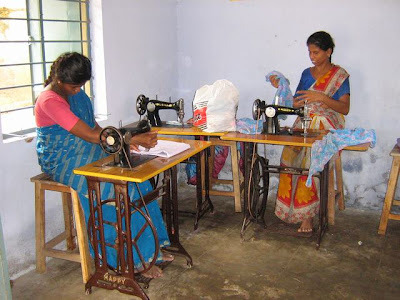 What does it take to make your livelihood worth living for? In my heart I wish we did not have to work for money but everything does seem to have a price,including the right livelihood. Tell me are you working to make a living or living to work? You probably thought that by the title of this post, that I would show you an array of swimming trunks, but no, just a stack of vintage trunks. We have a stack in our home perched on an amoire and I love the old leather. They were given to me by a dear old friend whose initials had been inscribed. 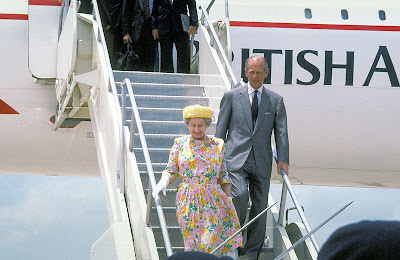 He traveled first class with these trunks and even a trip on the QE II. If only these trunks could talk. What would your trunks say about you. 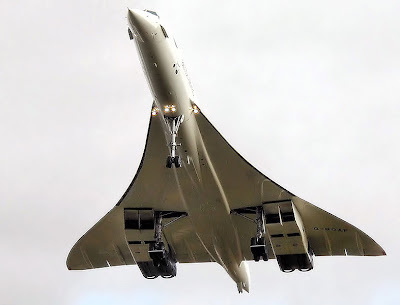 Are your trunks gathering dust or are you a frequent flier? 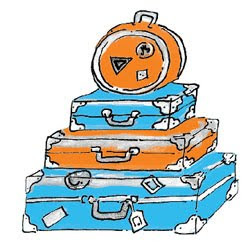 Have a happy friday wherever your trunks may go! I have always been in awe of those who have a modern, soulful style about them. I love meeting other women who exude joy and confidence in little ways. Bringing home a little bright bouquet, sporting a bit of velvet, hoops and confident hair that truly says "I am a happy mod soul!" 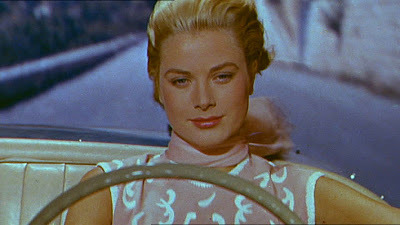 If you have not met this chic gal, please take a look at her new site - I am ordering myself one of these great t-shirts. 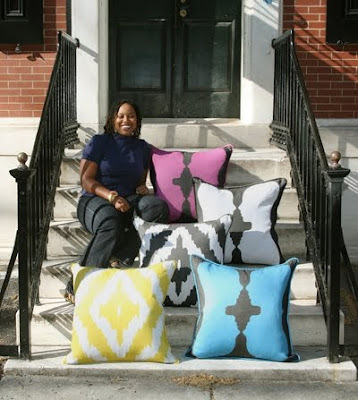 The pillows are fun too! Just the perfect accessory to add a cool hip vibe to my couch. 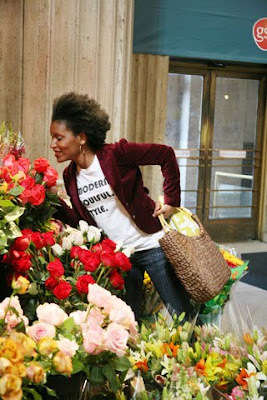 How do you add a modern soulful style to your day? Feeling witchy? Does Halloween bring out your inner Witch-craftiness? 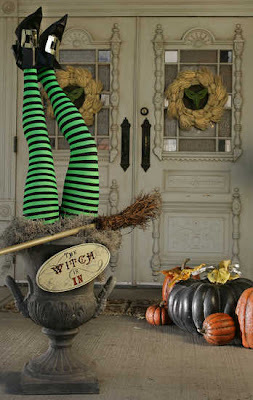 Does your holiday decor reflect you inner witch? Literally and figuratively, I work "step by step" when I am working on an illustration. 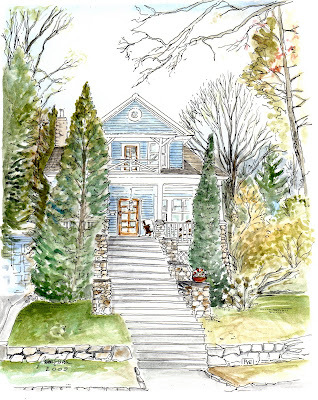 This home was done one step at a time, massing in the areas in pencil, the rock walls, the vegetation, the grassy knolls, the home and the steps. I then work in micron pen, erasing after the ink has had a chance to dry. A drafting brush to brush away the eraser crumbs is an important step. The final step is layering in the watercolor after a palette has been decided upon. Clean water is a must. Do you work step by step? This was a "give-away" for our school education foundation which I love to participate in. 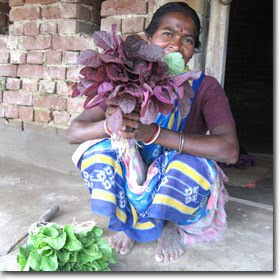 The winner and home-owner now has "House" cards, a postcard to send greetings. Sometimes, just a post card is the first step in connecting with those across the miles or even right next door. Do you have house post-cards to send to those near and far?